I first learned about the Great Big Table podcast from the Party Gamecast Podcast. The Party Gamecast heard about Jim and Adrienne’s love for the game Therapy and decided to do a review of it and then have the Great Big Table podcast do a Mystery Science Theatre commentary. Dr. Wictz So I have to ask, is therapy your favorite board game? Jim: Therapy. Yep, you know us too well. Dr. Wictz: Before I get too far, give everyone a quick run down about Great Big Table in case folks are not familiar with your podcast? Adrienne: More meeples for more peoples! Great Big Table is all about finding people, games, and opportunities to play board games. From building a game group to building a collection, we love to discuss the how-to of playing more games with more people. We game in a variety of situations: at home with our kids, with other adult gamers, with people who play very casually, and at a regular community game night we host, so the podcast reflects that variety by covering everything from Cthulhu-infested nightmare realms to teddy bears racing boats. Jim: Adrienne covered it pretty thoroughly. Great Big Table covers board gaming from the standpoint of introducing more new people to the hobby as well as getting those that have already discovered the hobby (new and old timers) to take up the mantle of evangelizing board gaming to their communities. As far as content goes, it’s just a late night conversation between Adrienne and I about a general topic after our three kids have been put to bed. We’ll talk about games that we’ve played in various settings recently. We cover thrift store finds, as it’s a great way to build up game libraries, and then we usually cover a main topic about some aspect of the hobby each episode. But, we’re not afraid to change it up if something strikes us as being fun to try, which is how the cross-over Therapy episode with the Party Game Cast came about. Dr. Wictz: Does being married make it easier to get together to do podcasts? From my vantage point, as a listener, it sounds like recording an episode is one of your options for "date night." Adrienne: That's what we thought when we launched the podcast, but it might be harder at times because we have to have relative quiet for a couple hours. Even now, we're editing out late night phone calls and "I need to use the potty" cameos by our kids who should be sleeping soundly. I suspect it would be easier if one of us could go to a quieter place and record, but it would be a lot less fun. Jim: In some ways it is easier, because we can just talk to each other and that seems to be compelling, at least from the feedback that we've received. Maybe that's why you get a "date night" vibe. We like to talk to each other and hang out, so that's not a problem. Like anything, though, there are logistics to consider. Life with three kids and trying to be active and engaged in our community while running a community game night, Adrienne managing a grant for our church, and planning and executing our annual Extra Life board game marathon weekend for Riley Hospital for Children (http://www.extra-life.org/team/stpetersgamenight) just takes a lot of time and energy. Because time commitments affect one or both of us, being married probably makes that part of recording harder. We wouldn't want to do the show without both of us, I think, because that wouldn't be our show. I am sure that's true for any podcaster, but we haven't struck on the formula to make them come out any faster, yet. We have plans to make that happen, so stay tuned. Dr. Wictz: What do you think you kids will think when they are older and they listen to past episodes of the podcast? Adrienne: Right now, they're fascinated by it and want to be appear on the podcast, that is until we get out the recorder and ask them to speak. If they should ever listen, I hope they'll laugh- even if it's at our general gooniness- and remember some of the times we've spent together. I'm also okay with them being embarrassed by us in the future. Jim: Our kids are fans of some podcasts. We listen to Flip the Table in the car together when we run errands on the weekends. They even sing along, with well timed bance's, to its theme song. So, they were very intrigued by the idea that we had our own podcast. I'm sure it'll embarrass them in the future, but I hope they hear that we are having a good time together and appreciate that aspect. That's the best we can hope for. Dr. Wictz: You have mentioned on your show you met in college, but you have not gone into the details on how you met at college, so I ask, how did you meet at college? Adrienne: A mix of my procrastination and Jim's geography put us both in the very last summer orientation group. He flew over from Germany where his dad was serving in the Army and we both arrived to a campus neither of us had even visited before. There were only a few core classes with space remaining, so we both ended up in Asian Politics (amazing class) followed by Issues in Human Genetics. He was jetlagged, and I skipped most of orientation for another event, so we didn't meet there though I clearly remember an advisor making a joke about his name. There was this unpleasant and aggressive kid in both those classes who kind of adhered to me, and I noticed Jim and another guy in both classes who lived in my dorm, so I asked them if they would let me walk with them to and from class a couple times. Jim was shy and hardly said a word to anyone at first, but he would write these hilarious notes with drawings during class and we just hit it off. No one would describe him as shy today. Jim: I came to my college orientation after a twenty seven hour trip, on my own, from Frankfurt, Germany, before cell phones and when long distance phone calls required a second mortgage on your house. I almost didn't make it to our college town because the commuter carrier that the Department of Defense bought my ticket from went out of business between the purchase and my trip. So I was a stranded eighteen year old in the Saint Louis airport the day before my college orientation and two weeks before the start of school. I was exhausted and emotionally wrecked by the time I figured how to get to my destination and went through orientation. I remember seeing Adrienne in orientation, but not much else from the entire thing. I took the only honors courses that were available, as did everyone else on that orientation group, including the aggressive kid and the guy who agreed to walk with and sit next to Adrienne in order to put Mr. aggressive off. If I had had my wits about me, I might have declined the option to take one or both of the classes that Adrienne mentioned. As it stood, I owe a lot of the best things in my life to pure chance. Dr. Wictz: Do you see the Great Big Table podcast as a supplement or a competitor to the Baby Toolkit: parenting gone geek blog? Adrienne: Baby Toolkit is about to turn 8, so it felt established in its own arena by the time we started the podcast. I won't speak for Jim, but I never envisioned a lot of that readership tuning into a podcast on board games. Generally if mom bloggers transitioned from blogs, it was to to vlogs, and podcasts never exploded like they did in other arenas. It may be the need for a quiet space that is the major hurdle. Thus far in this interview, I've supervised two kid baths, dealt with a "code brown," answered the phone, and worked on a couple loads of laundry. The written word waits, and I really appreciate that. We definitely love to review board games on the blog that are kid and family friendly on the blog. We also talk about some of the same topics like community gaming, Extra Life, and Gen Con. I welcome crossover participants, but they always surprise me. Jim: I never envisioned a lot of crossover. Sometimes we review games or mention the podcast on Baby Toolkit, but its just incidental to being part of our life and being geek parents. Dr. Wictz: Unintentional (I think), thrift store/garage store finds have become a recurring segment of your podcast. Why did you start looking for games in these places? Adrienne: We embraced aspects of simple living early in our marriage. We were married, marginally employed, and finishing college, so we didn't have to give much up to embrace the philosophy. A concern for reuse and the labor conditions in foreign clothing manufacturing made me interested in purchasing fewer new goods. Once I started shopping consignment and thrift, it was just a matter of browsing a few more aisles to expand to games. My favorite game find remains the cards-still-in-shrink San Juan game I found on vacation. It's not only a favorite game of mine, it also piqued Jim's interest in resale shopping for games. Our next episode, the one on our hard drive, is about gaming on a budget, so we pull out all our tips and tricks for resale game shopping. Jim: Adrienne found a bunch of great games after thrifting for a while. I thought it was great, but never joined in until stumbling across a Buffy the Vampire Slayer Game in a Goodwill close to my work. I had heard it mentioned as a grail game on a number of podcasts, so I scooped it up after confirming that it had all its pieces. After that I was hooked. We, well mostly Adrienne, have found some great stuff over the years. I'm always amazed when we find games for a dollar that have obviously never been played. Also, its been a big help in filling out our community game night's library. I think Adrienne's find of San Juan is one of the best. It blew my mind that the cards were still in-shrink and it only cost two dollars. As for my own finds? It would be a toss up between Buffy and the unpunched aMazing Labyrinth that had never been played. Dr. Wictz: Why did you start Great Big Table? Adrienne: We started Great Big Table after Jim noticed the topic of gaming groups coming up on a number of podcasts. It seemed like more people were actively looking for gaming groups, and we could really sympathize. We spent most of our twenties hoping to find a group to join (this was back in the middle '90s, so the hobby wasn't as widespread as it is today). In the past decade, we started creating new communities, and we wanted to help other folks not spend a decade hoping to find something they could create now. Jim: I listen to a lot of podcasts produced by the board gaming community. I had commented during a car trip that issues around community building, promoting board gaming as a hobby, and game groups were regular topics on most shows. As we had been addressing these areas in our own life, I thought that we might be able to record a podcast around those ideas. Adrienne wondered if there would be enough material in that topic until we proceeded to spend the rest of the three hour trip hashing out all the areas that could be covered. We have a multi-page Google Doc of show ideas that mostly came out of that conversation. Dr. Wictz: If you were introducing someone to the Great Big Table podcast and you could only select one episode for them to listen to which episode would you select? Adrienne: Much like our children, I love each episode for different reasons. I laughed the hardest making the Therapy the game episode with the Party Gamecast. If someone is willing to give us their time, I would probably recommend the first episode, so they can decide if they want to embark on this journey with us. Jim: We don't have a lot of recorded episodes (yet!). You'd think it would be easy to choose one, but I like pieces of all of them for different reasons. There are moments in each that make me laugh and those are the moments that I like the best. Because of that, if I only could choose one, it would have to be the first one, episode zero. A lot of the running jokes have their start in that episode. It also has tells the most about our history, so I think you get a good introduction to us as people and gamers through it. That doesn't mean that it is the best edited or sounding, but it is probably the one I would choose. Dr. Wictz. How did you come up with Great Big Table as the name for your podcast? What were the other contenders? Adrienne: I'm sure I blocked any contending names from my mind because they were probably ridiculously bad or already taken. My oldest was obsessed with the song Welcome Table around that time, and I really like that idea applied to gaming. Great Big Table is, in my mind, a place where there's always room for another player and new conversations. It's my ideal of gaming, good company and an open invitation. And yes, in my mind's eye, the table offers great snacks, I love food. Jim: I remember this. We like naming things and have come up with some good names for various things over the years. Part of that three hour conversation about the podcast was brainstorming names. At one point, one of us, I think it was me, suggested "At The Table" and Adrienne pointed out that it was close, but not exactly right. She mentioned the Welcome Table connection and said that we wanted something that had that welcoming vibe. We started wondering out loud what would make for a welcoming game table and Adrienne said something about one that was big enough to hold everyone that wanted to play. That made me think about the "big tent" idea from politics and religion (a tent big enough to cover a large group). Then Adrienne said it should be a Great Big Table and that was it. I loved it instantly. Adrienne: It is one of our great hopes to put out at least one episode a month. We have had a great incentive to do so, but there have been some pressing family things that have kept us in the very slow lane. We always aspire to issue episodes more frequently. Our target is 1-2 episodes a month. Jim: It's never been our plan to have them recorded so sporadically. It just happens to be that way at the moment. A friend's son compared us to a season of Sherlock; one to three episodes a season and then we're done. That's a nice way to think about it, but it isn't our intent. With school starting for two of our kids, and some of our other community commitments winding down, we're hoping to pick up the pace on our recording, editing, and release schedule. Dr. Wictz: If someone wanted to learn more about your blog where should they go? Adrienne: Is this a trick question? To the blog, I would guess… BabyToolkit.com. I can’t imagine any other source of information about it. We also have a blog attached to the Great Big Table podcast at GreatBigTable.com. Jim: We also gab a lot on Twitter as @babytolkit and @greatbigtable. On the onset prices appear to be a simple thing. A price is what one has to pay to get something. But what that misses is what prices can achieve as a mechanic and a tool. A price mechanic is a way to communicate information between players. To distinguish a price mechanic from a price theme I am going to distinguish the difference between fixed prices and negotiated prices. A fixed price is a price theme. Fixed prices are created by an outside source, most likely by the rule book in the board game. A fixed price states in no uncertain term something is worth X. The price in this instance is being used to communicate the tradeoff of game actions by the game designer to the players by using a set of fixed ratios of one action versus another during game play. Take The Game of Life, the price to change your degree is fixed on the board. If you want to take a chance and stop being an accountant then you have to pay a fixed X amount of money to change jobs. The player has to decide if they want to use their money to change jobs or do they want to save it to pay for 2 future doctor visits. The fixed price enables money to serve as a simplification of the tradeoff between one action versus another within the board game. A negotiated price, a price mechanic, is when two or more players have to agree on a value to make an exchange. In Michael Keller’s Captains of Industry players require resources to build and operate factories. They get these resources by negotiating prices with the other players who happen to have these resources. When prices are negotiated, prices in the game communicate the value of the goods or actions amongst the players. You do not need to know why a player wants a good or action to know that they desire it. All you need to know is how high of a price a player is willing to pay to buy it or sell it to gauge their desire. The economy uses communication from prices to coordinate production and supply. Economist Leonard E. Read shows in his story I, Pencil that pencil makers can communicate to wood producers their desire for an increase in the wood supply to make pencils by offering to buy wood at a higher price. Wood suppliers see the higher price and are willing to pay more money to entice people to be lumberjacks and to work longer hours to produce more wood. The person who supplies the wood does not directly see that pencil makers need more wood. For all the lumber supplier may know, paper makers and furniture makers might desire more wood. The magic of a price mechanic and negotiated prices is that wood suppliers never have to spend time guessing if specific industries or the world needs more wood. The price for wood communicates to the lumber suppliers people’s desire for wood and they respond by working to increase their output. If players need wood to expand their farm or stone quarry in Captain of Industry they communicate their desire for wood by the willingness to pay a high price for it. Players producing wood may not know why other plays want wood so badly, but they will see from the price there is high demand by other players for it and will invest to expand their output of wood in response. A price themed only game does not have negotiated prices between players. A price themed game may still have a money mechanic. Speculation has fixed prices for stock decided by events on the game board, making the game a price theme. Players exchange money with the bank to take risks in Speculation to possibly earn more money later in the game, meaning the game has a Money Mechanic. Money mechanic games can also be a price mechanic game. Michael Keller’s Captains of Industry players negotiate with each other to exchange goods for money. The prices settled upon communicate what goods players desire, and hint at what moves players will make next since each good can only be used to complete so many actions. But what about games based on batter, like Settler’s of Catan. Can Settler’s of Catan’s barter economy be a price mechanic or price themed game even though there is no money Mechanic? The answer is yes. Because barter involves setting prices in terms of one good versus another. My offer to trade 2 wood for 1 brick means that the price of 1 brick is 2 wood. Some prices in Settler’s of Catan are price themed. I can exchange for a fixed price four of any one good to acquire a different good. This is a fixed price that is not an exchange of information between players. On the other hand, other prices in Settlers of Catan are a price mechanic. Players can select to trade with each other. When a player offers to trade with another player they are negotiating and in the process communicating information about the importance particular goods are to them to their opponents. Why Differentiate Price Mechanic and Price Theme? I differentiate between price mechanics and price themes because they create different experiences for players. Price mechanics create a new dimension for board players to compete with each other. Price mechanics are driven by supply, demand, and information. It rewards players who can best track information to decipher current prices and anticipate future prices. Take my horse racing game Post Position. Players actively engage in a market where they trade bets on horses throughout a horse race. The final value of a bet on a horse is settled by the order the horses cross the finish line. Each player has inside information not held by others on how the horses are going to move in the race. When players make bets, they are agreeing on a price for the bet. That price communicates information to all the other players on who thinks a horse is going to move up and who thinks a horse is going to move down in the race. The winner is the player who best uses their inside information and best reads other players trades to figure out the horses that are going to do well and the horses that are going to do poorly before everyone else. Fixed prices are constraints imposed by the game designer. Without a complementary price mechanic, fixed prices represent a set of actions a player needs to compete to acquire an action, resource, or victory point. They are merely a tool used by the game designer to communicate the rules of the game to the player. Andy Low of Random Access Podcast asks Dr. Wictz and TC Petty III what makes a good rule book. Games that use money: The Game of Life, Monopoly, Daytona 500, City Hall...the list goes on and on and on. But for something that is so prevalent in board games, money as a mechanic is an understudied topic. Why use money? What is the purpose of a money mechanic? And for the more philosophical folks out there, why do we even use money in real life? To understand why people use money we need to understand what the world looks like without money. Without money how do people get stuff from other people? Without money some folks may get stuff as gifts or get stuff by stealing it. Most of us are going to get stuff from other people by trading one thing for another. Economist have a formal name for this, they call it a barter economy. Conceptually barter economies are easy to grasp. I have something you want, you have something I want, we trade and we are both better off. The downside is that barter economies easily become incredibly complicated. Imagine that instead of wanting a back rub for a slice of pie, you wanted a horse shoe for your horse instead. Well, I need to go find a blacksmith who will trade me a horseshoe for a back rub that I can take to you to trade for a slice of pie. If I cannot find a blacksmith who wants a back rub in exchange for a horseshoe, I have to find someone else who has something the blacksmith wants for a horseshoe. Searching for the people I need to trade with to get an item the blacksmith is willing to exchange for the horseshoe I need to trade for a slice of pie takes a lot of time. The time I spent searching is time I no longer have to relax or give other people back rubs in exchange for other things. Money reduces the amount of time I spend searching to make trades by being a medium of exchange all buyers and sellers will accept. If everything is priced in pounds of wheat then I no longer have to find the person supplying the exact good you want to trade for a piece of pie. I only need to find enough people willing to pay me wheat for giving them back rubs to get a piece of pie. You are willing to accept wheat in exchange for pie because the blacksmith is willing to accept wheat in exchange for a horse shoe. A medium exchange can be a commodity, like wheat, or pieces of paper/coin we call money. Money has the extra benefit (in real life) of being much easier to carry around then pounds of wheat. Money can also be backed by a commodity or by nothing at all. No matter the case, money is a tool to make it easier for people to trade with each other. Money works best in board games when it simplifies trades. Take The Game of Life. All actions in the game can be reduced to whether or not you can exchange a single item to get a good or service. Imagine playing Life where the Accountant gets paid by the Singer with a ticket for a rock concert. How then does the Accountant pay the Doctor later in the game when their child gets sick. One way the game could have accomplished this is to include a set of tables that informs players how much of each service can be exchange for another. For example, it might say that 3 rock concert tickets are worth 1 doctor visit. A table large enough to account for all the possibilities of exchanges in The Game of life would be fitting for an Avalon Hill game. Instead the game simplifies game play and reduces components by translating the ratio of goods exchanged into equivalent ratios of money exchanged. If it takes 3 rock concert tickets to pay for a doctors visit then in a world of money rock concert tickets earn 1 dollar a show and a doctor visit costs 3 dollars. Money takes all actions in The Game of Life and turns them into a single unit that can easily be observed and exchanged for any other actions in the game. No need for any complex formula or table of exchanges that eats up time and takes away from gameplay. Just because money makes trading easier, that does not mean making trading easier is desirable in a game. Settlers of Catan thrives on people navigating a barter economy. Players have to navigate the process of trading wood for stone so they can trade stone for brick with another player. They have to plan their cities and roads to acquire the commodities they need, both for trade and gameplay. Imagine Settlers of Catan where settlements earn cash instead of a resource and construction was purely a matter of price. Players would just focus on only placing the cities in locations that maximize earnings. Decisions available to players would be reduced. Players would no longer be interacting with each other over trading this for that. In essence the game just became a new form of solitaire where you roll dice. Money reduces too much of the games complexity. Money is only a theme if there is no exchange ever made with it. Imagine a game where the person with the most money wins the game. In this hypothetical game, you earn money by completing a task. Once the money is earned you just hold onto it as a victory point for the end of the game. The money is not used in any exchange. Money, in this case is a theme for the victory points in the game. Contrast this with the HoopCat’s game Fill the Barn. In Fill the Barn the player with the most money wins the game. However, players also need money to plant, fertilize, and harvest crops. These are all actions within the game that might result in earning even more money. So money is not just a victory point condition, money is also a way to exchange victory points you have now to take risks that might reward you with more victory points in the future. 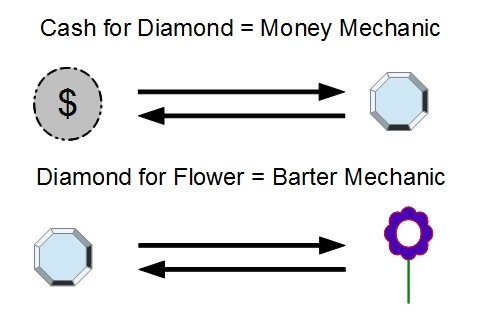 In this case money is being used as a tool to simplify exchange, making it a mechanic.